Avid readers may remember a few years ago I blogged about the statistics of objects formed by disc fragmentation. In our paper, we looked at tidal downsizing, to see if big fluffy disc fragments with masses bigger than Jupiter could form solid cores and lose their gas to become objects of Neptune, maybe even Earth masses. We created what’s known as a population synthesis model – this is essentially a way of running lots of simulations very quickly to get lots of output data, in our case lots of fragments which have evolved to form objects (or not, as the case may be). We discovered that making terrestrial planets is very hard – after producing millions of disc fragmentation events in our model, only one of those objects went on to make an Earthlike body. In fact, we lost about half of the fragments to tidal disruption – they were ripped to shreds by getting too close to their star before they had become fully formed. Most of the surviving fragments were giant planets or brown dwarfs orbiting at about Neptune’s distance from the Sun. Our one in a million Earthlike planet formed by tidal downsizing, all alone at the bottom of the plot. But, our model was incomplete. We wanted to run millions of simulations, so we had to simplify the physics quite a bit. This is a common problem for population synthesis models, as they need to run to completion without it taking millions of years! The only way to beat it is by using clever algorithms and lots of supercomputer power. One of the most important pieces of physics we jettisoned early on was fragment-fragment interactions. Our discs were fragmenting to form multiple objects with relatively strong gravitational fields – they should be pulling on each other and changing their orbits. Also, the systems were likely to still be in their parent star cluster. All those nearby stars would have a gravitational effect as well! Instead, our fragments coast along on nice circular orbits. We didn’t add gravitational interactions to the model because it would have needed extra computational power, and would have taken much longer to produce results. Also, we knew that in the simulation, the disc would have been the biggest nearby source of gravity, and would have acted to smooth out these orbital changes. But eventually, the disc will disappear. Then what happens? We decided to run our models through N Body simulations to find out. With the help of Richard Parker, we placed our systems into his star cluster simulations, and we ran separate simulations to find out whether the planetary systems the model produced were stable. An example of an unstable planetary system produced by the population synthesis model. Four bodies orbit the star initially – two bodies get launched away from the host star, leaving two in stable orbits. So what did happen? One thing that happened quite a lot (about 25% of the time) is that a planet or brown dwarf gets ejected from the system. 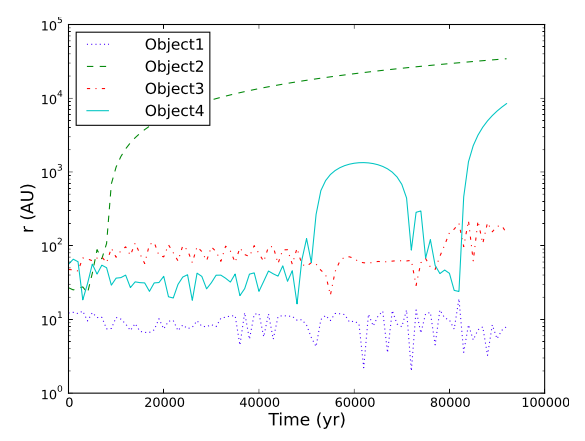 This means that if disc fragmentation happens regularly, we should see lots of free floating planets! Many of the bodies still orbit quite far from the star, but they now have very eccentric orbits. We know that some exoplanets have very eccentric orbits, like HD 8606b, so that is a sensible outcome. Our simulations can now give us some predictions for what we should see with the next generation of direct imaging surveys, and we are working with observers to figure out whether our predictions match up with what they are now seeing. Some, but not many, of the bodies get pushed very close to the star, probably close enough to become Hot Jupiters. This is where it gets interesting, because these will look very similar to Hot Jupiters formed by other planet formation mechanisms, like core accretion. How do we tell them apart? This is something we’re working on right now, and I hope to tell you more about it soon. We all know that life on Earth depends on the Sun, and not just to keep the cold out. Plants convert sunlight into energy through photosynthesis, giving us oxygen to breathe, and in one way or another, the whole food chain relies on our parent star for support. But what if our solar system had two stars? We know that there are several exoplanet systems out there that have the luxury of multiple host stars. 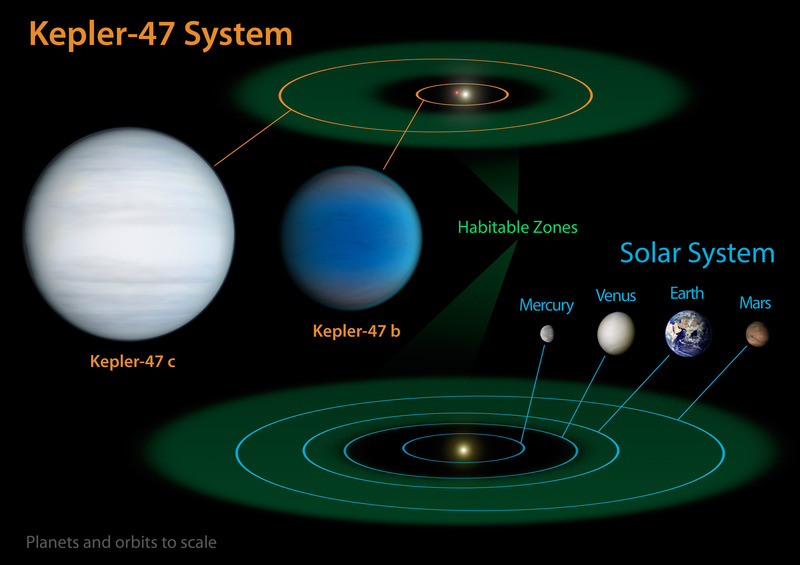 In the case of the Kepler 47 system, there is a planet in the habitable zone (confirmed by several teams of astrobiologists, including myself). Kepler-47c orbits a star quite like our Sun and a cool red dwarf star (see graphic below), and so we refer to it as a circumbinary planet. But what would it be like to live on a planet like Kepler-47c, and gaze at a double sunset like Luke Skywalker? Would life be all that different? In a paper recently accepted for publication by the International Journal of Astrobiology, we explored this question. Strictly speaking, it would probably be quite hard to stand on Kepler-47c, as it’s probably a gas giant comparable to Neptune, so we imagined that Kepler-47c was in fact an Earthlike planet – after all, chances are that there is a planetary system out there like this. We considered how the radiation from the two stars hit the planet’s surface, mapping patterns of light and darkness. Because the two stars in the Kepler-47c system are so different in mass, they produce radiation at very different wavelengths – the sunlike star emitting a spectrum that terrestrial plants would happily photosynthesise, and the other star emitting much more red and infrared radiation, which some forms of anaerobic bacteria would photosynthesise (see more here). So depending on the time of year and time of day, different organisms would take the lead in converting starlight to energy. But it’s not just the light patterns that are interesting. The darkness patterns show that above the polar circles (on earth, these are the Arctic and Antarctic circles), summer and winter become rather peculiar. Above the arctic circle on earth, winter begins when the sun sets, and stays set until winter ends a few months later. On our Tattoine planet, there are two stars in the sky, so the arctic winter begins when both stars drop below the horizon. But the planet orbits the centre of mass of the system, as do the stars. This means that depending on the arrangement of all three bodies, some years have a winter that is a few days too short, and others have winters that are a bit too long. If you’re an animal counting on the end of winter to end your hibernation cycle, you need to know whether this year’s winter will be long or short! Judging by life on earth, it seems likely that animals will be able to develop instinctive and biochemical rhythms to cope with these fluctuations, just as we have circadian rhythms to cope with day and night time. In fact, some organisms on Earth already obey the influence of a second star – except it’s not really a second star, it’s just the Moon! In short, life on circumbinary planets will be a slave to the rhythm, just like life on Earth. But there will be many more rhythms to choose from! I gave a quick 8 minute talk in the “IMF: Facts and Myths” session on the properties of brown dwarfs – those awkward objects that are too small to be stars, but too big to be planets. 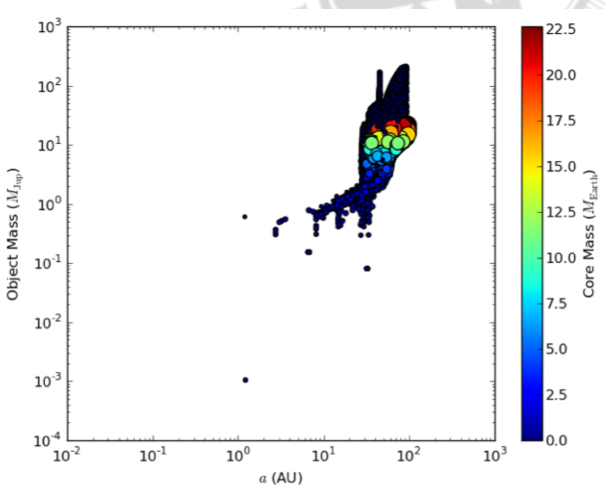 These in-betweeners turn out to be a very sensitive probe of planet formation theories, and observing the mass distribution of brown dwarfs should tell us whether they are more starlike than planetlike (more on that in a future post). My effort was inspired by Pythagoras’ musica universalis, or “music of the spheres”. Pythagoras, and others like him, were convinced that there was a deep relationship between mathematical concepts and music. Music theory depends heavily on mathematics, but Pythagoras believed that mathematics itself was inherently musical, and that the Universe moved to a deeply beautiful set of rhythms and harmonies. For example, he believed the motions of the planets produced a music that, if humans could hear it, they would not only consider it beautiful, but discover a deeper understanding of how the Universe worked. So, I thought about the music in planetary systems. We have the benefit of knowing many more planets than Pythagoras did, orbiting stars other than our Sun. Even for a musical dunce like myself, it’s easy to create musical notes from the properties of planets. And that’s exactly what I did for my hack: I took exoplanet data from the Open Exoplanet Catalogue, and made repeating notes for each planet. The period of the planet’s orbit dictates how frequently a note is played. If a planet orbits its star once a year, then its note will play once per second. The pitch of the note is determined by the planet’s size – small planets play a high pitched tone, and large planets play a low pitched tone. The inner planets orbit the Sun quickly, and make a series of high pitched ringing sounds, with the giant planets beating out a slow, ponderous bass line. The code I wrote to make this music is open-source on Github – you can find it here. It’s written in Python, and has a reasonable user interface (remember it’s a work in progress!). Happy music making!